The Handbag is undoubtedly the most important accessory for a working woman. A lot of things have to be considered for the correct choice of handbags – the person’s preference to color, style, as also nature of work, not to mention pocket. 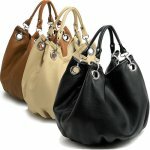 Select a bag with an adjustable strap which when slung across the shoulder, sits firmly. Also advisable is a bag with a zipper on the outside. This ensures that one need not remove the main flap/zipper for small transactions like taxi and public transport fares. A good handbag must have at least two main pockets as well as a secret pocket. 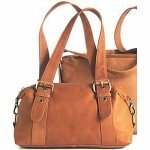 Leather, Rexene, or buff satin finish bags are the most popular among working women as they are durable as well as maintenance friendly. Choose a neutral color (usually black, brown, deep maroon are the most popular) so that it goes with most of your wardrobe. Let the design be plain and trendy so it goes with both Indian as well as western clothes. Avoid shiny plastic bags and those with beads for they do not look professional. Also avoid transparent ones for office. They look cool for shopping or for causal outings but not for the work-place. Light colors can be done away with especially if traveling by public transport and if you stay long hours in office. Do set aside a small and trendy bag to use it on the days of the week whenever you feel like going in for a change, but not at the cost of your convenience. Every woman’s handbag should be big enough to hold the basic items like a stylish purse, business cards, pens, cell-phone, CDs and floppies, sunglasses, a few basic cosmetics for a quick touch-up, a thin silk scarf, hairbrush/comb, small change in all denominations etc.